Holy Bat-ception, Batman! 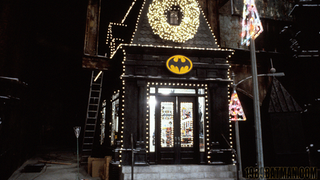 Apparently Batman Returns was going to originally feature this store - a merchandising shrine to all things Batman, based upon his shenanigans in the first Burton Batman film. Check out plenty more pictures after the cut! The images come from 1989Batman.com - and recently re-emerged on Reddit - and come with the details that apparently the store would've been shown being blown up, but the scene was cut for whatever reason. But look at all the awesome and slightly absurd faux Batman Merchandise (well, some of it was real merchandise at the time too) that was inside as set dressing! It's kind of amazing to imagine the idea of someone in Gotham setting up a Batman gift shop in the years after the events of Batman. I mean, when you think about it, why the hell wouldn't there be stores like this in the wake of every superhero making themselves known?